Talkhoon is a bright girl, imaginative and sensitive, living in Iran at the time of the 1979 revolution. Having a mother who mysteriously disappeared and a Father out pursuing his political ideals, Talkhoon and her sister Taara are brought up by their grandparents in the old family home, Drum Tower watched over by their Uncle Asaad. As unrest in Iran begins to grow, Talkhoon's family collapses around her. Her beloved grandfather is lost to her and she falls into a deep depression, further alienating her from the rest of the household. Asaad remains unfalteringly loyal to the girl, but his motives prove to be sinister. When Taara runs away to escape an arranged marriage, the girl soon finds herself alone in the home, which quickly becomes her prison. At its heart this is a novel about inner strength and the ability to overcome adversity. It is beautifully written and the author's creation of a mythology around the family adds depth and complexity to the relationships between the characters. 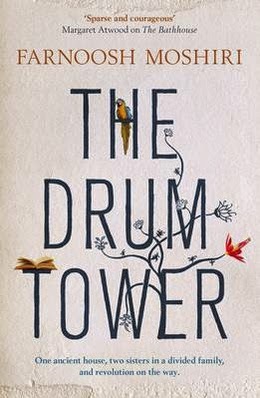 It is not difficult to see why The Drum Tower won the Barbara Deming Memorial Fund Fiction Award with its poetic language and ambitious themes. This is a weighty story which offers rich rewards to its readers.